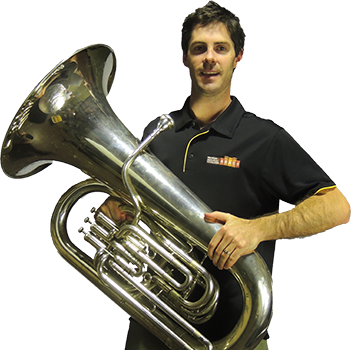 Principal Eb Tuba player and RASWA Brass President Stu Bennion came to Perth in 2008 after 16 years of performing with brass bands in New Zealand, including Dalewool Auckland Brass and The Trusts Waitakere Brass. A UK import, Stu hails from Wales, where at the age of seven he started playing the tenor horn with Gresford Colliery Welfare Band, sitting next to his late father. He moved to Flugel Horn, then Euphonium before finally settling on Eb Bass. 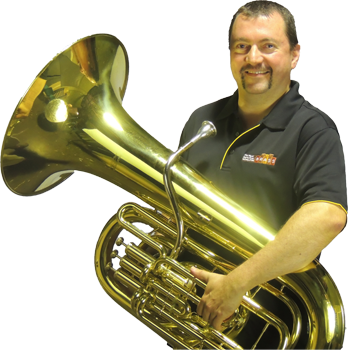 Stu played with many UK bands including the very successful Beaumaris Brass Band, until a move to New Zealand in 1993 saw him join Continental Airlines Brass, now known as Dalewool Auckland Brass. During his time at Dalewool, Stu made a significant contribution in their many New Zealand and Australian titles. Ben enjoys fun indoor and outdoor activities such as, but not limited to, farmyard snap, the recycling game, being a fairy, and building cubby houses. His career highlights were winning the Citizen of the Year award in year 6, and being named basketball finals MVP for which he won a pair of socks which were too small for him so he gave them to his wife. She was the real winner. His highest score in cricket was 71 not out. It was a hot day and his parents were worried about him getting sunstroke. Later that day, he bought a wirrow and his cat got into the cage (which was obtained from a front verge during council junk collection) and killed it. He never owned a reptile. He also played, and still plays the tuba. He can read treble clef and bass clef. And can read several different key signatures. Alex didn’t choose the Tuba, it chose him. Well not initially but now over 20 years on from first picking one up he only wants to be a bass man. Growing up Alex was never that big so a trumpet or cornet would have made more sense but after six months of trying to learn to play the trumpet in year seven his teacher decided to give him a baritone. He then progressed up to the tuba as he got a bit bigger. Because the tuba was hard for him to cart around Alex purchased an old golf cart from the markets but that broke half way up the stairs on the very first day. The tuba went crashing to the bottom with a loud thud. Luckily there was no one around to get hurt and the tuba was undamaged. It still surprises him to this day that no one came to see what had happened. Alex prefers playing in brass band/ensembles but spent many years playing in concert/wind bands. He has also attempted a few solos and performed in some amateur orchestral concerts although counting bars makes him want to be in a bar. With RASWA he initially joined on E Flat Bass in September 2001. In about 2006 there was a need for someone to play B Flat Bass at a concert and this is when he realised that he could tame the beast. Shortly after this he moved there more permanently because there was a surplus in the E Flat Bass department and a deficit in the B Flat Bass players. He is still there and enjoys the challenge of pumping out the low notes, especially the ultra low pedal notes. Andi’s love affair with brass began in year 6 when she took up the baritone, and as she grew bigger so did her instruments. Quickly graduating from the Baritone to the Euphonium and then to the Tuba, for no other reason than there was no Tuba player in her high school band and she would therefore be the best. Having never owned a Tuba and only playing one on loan from her school, Andi feared that after she graduated her playing days would be over. Alas, WA Brass was here to help! She has now enjoyed playing in the band since 2016. Although music doesn’t exactly compliment her Politics and History degree, she says that it is a skill she never wishes to forget and would encourage everyone, no matter how young or old, to play or take up an instrument. Matthew began his musical journey on Trumpet in year 6, but quickly realised his real match was the Tuba. After all, bigger is always better. Matts musical journey is showing no signs of slowing as he studies the Tuba at UWA, playing in 5 ensembles and practising everyday. 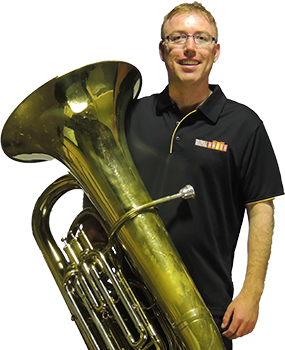 He has loved playing with WA Brass since he joined them in 2017.